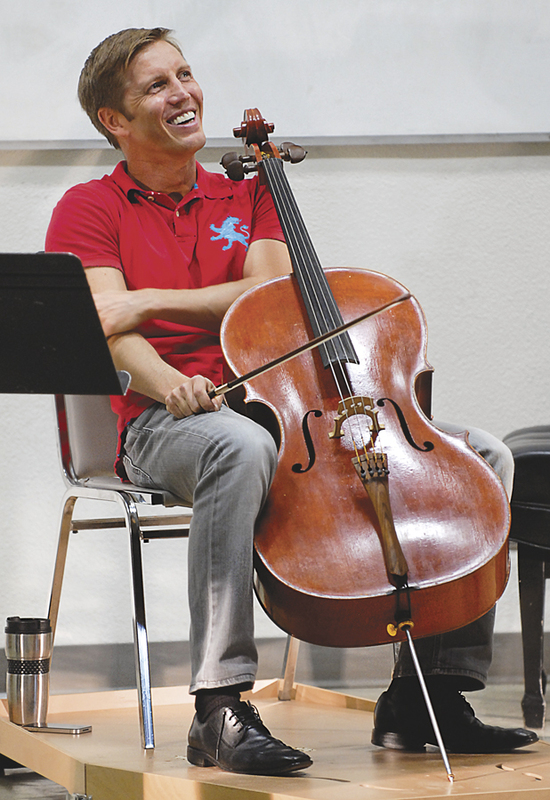 Hardly a chair was left empty in the Music Building concert hall as cellist Ruslan Biryukov and pianist James Lent played together officially for the first time for the free afternoon concerts series held Thursdays. Both have appeared separately at Pierce for the concert series in other semesters, but this is the first time they have played together for this occasion. Both musicians love coming to Pierce because of the respect the audience at the concerts always show, and both would come to Pierce again. “I always appreciate the students and enjoy the questions asked,” Lent said. Biryukov and Lent have known each other for 10 years through the University of Southern California and through Lent accompanying Biryukov during various competitions. Biryukov started playing the cello at the age of 7, when he was forced to switch to a new instrument because his mother refused to teach him piano any longer. “I was kind of happy,” Biryukov said. After failing the entrance exam to a music school, he was contacted by the director of the school who informed him that he could receive cello instructions at one-twentieth the cost of continuing piano lessons elsewhere. “I didn’t enjoy it at first, but I grew to enjoy it as I learned how to express myself through its sound,” Biryukov said. Lent, on the other hand, has played piano his whole life since he was 8-years-old. He started playing because of his experience listening to his next-door-neighbor play, and received lessons from a neighbor across the street. “It just made an impression on me,” Lent said. Kinesiology major Mattew Mike,21, attended the concert for his music appreciation class, but even coming to the concerts has sparked his interest in the musicians that play at Pierce. “I’ve never been to a performance before [my] music appreciation class,” Mike said. Biryukov and Lent’s concert was just another reason for him to enjoy the ability of professional musicians. Although members of the audience were impressed by the performance, Biryukov and Lent feel that there is always room for improvement.